It was the best day of my life to that point, and it has only gotten better since then. The truth is, not that long ago, I wasn’t sure we’d make it to this point. We hit a really, really bad patch about two years ago, including a betrayal by someone I trusted and considered a friend. Kris and I had lost our connection to one another, and it left us open to that betrayal. It wasn’t easy getting it back. We almost gave up a couple of times, but thankfully we took the hard road and worked on our marriage, and our relationship now is better than it has ever been. Kris, I love you more than anything on this earth, and I can’t imagine what my life would be without you by my side. I cannot wait to see what the next ten years bring us. And now, for the wedding meme I stole from Morninglight Mama, who married her silly man just a week or so before I married mine. We met at the Meadville Community Theatre, where we were working on a production of Damn Yankees – I was Gloria, the reporter, and Kris was one of the baseball players. The funny thing is that until that point, I had only done shows at the other community theatre in Meadville (The Academy Theatre), and had only auditioned for Damn Yankees because the director was a customer at the copy shop where I worked, and had mentioned it to me when he was in at one point. Oh, Kris loves this one. He was sitting behind me at a musical rehearsal, and the guys were doing one of their numbers. If you’ve met Kris, you know that he has a lovely deep voice. We hadn’t actually spoken to one another at this point, but I had heard him talking, so I knew this. He was trying to sing the tenor part. It wasn’t pretty. So, at one point, I turned around and said “WHAT the hell are you doing? !” (Friendly and kidding, I swear!) He looked baffled and just said, “Um, singing?” I replied “Dude, you’re a BASS. Why are you singing tenor?” He had no clue what I was talking about. I found out later that because no one in his very small school district had known what to do with him as a bass, he was just always told that he couldn’t sing. It’s total baloney – when he’s in his range, he has a wonderful voice. We went to see “L.A. Confidential” and had dinner at Friday’s. Unfortunately, it was an awful night. Jason and I were still dating but falling apart and were doing the whole “Ok to see other people thing”, but it just freaked me out too much, and at the end of the night, I told Kris I just couldn’t handle it. So, yeah – our first attempt at dating was a disaster. For that matter, so was our second. Kris gave me another shot, and we dated for a couple of weeks that October. When I realized that I was developing real feelings for him, I freaked, because I was still holding on to the delusion that Jason and I could work out our issues. So, yeah. I broke up with him twice, and he STILL gave me another shot. Thank goodness he’s stubborn, because damn was I dense. When we were at Friday’s, waiting for our table, we were sitting at the bar. He came up behind me and kissed me on the cheek. I got that fluttery feeling in my stomach. Truth be told, I still do. A couple of weeks later, we went to State College for a weekend to see a touring production of Damn Yankees and so Kris could show me Penn State. That was sort of the “official” engagement trip, since my ring was ready by then (The jeweler was setting the diamond and making the wrap fit the shape of the stone). Also, Kris found a bunch of logo golf balls for Dad’s collection while we were there, so it was legit. We were married outside of Old Main on the quad at Westminster College, my alma mater. That’s Old Main in the background of the first picture up top. Our reception was at a restaurant (The Tavern) where Mom and I used to go when she’d come up to visit me. 8. Any disasters during the special day? *sigh*. This is a tough one. A few weeks before the wedding, my mother called me, and told me that Kris needed to call his parents. She had called them to ask if they wanted to be included on the invitation and, if so, how they wanted to be listed. At that point, Kris’s mother told her that they did not want to be on the invites and that they would in fact not be attending at all. Kris had no idea of this. He called his mother, who told him the same thing. They felt that Kris and I were marrying too quickly and were not willing to be a part of it. When it happened, I told him that if he wanted to postpone the wedding, I was totally ok with that, but he said no. He wanted to be married to me, and he was ok with them not being there, if that was the choice they wanted to make. So, yeah, his parents not being there? Kind of a disaster. 9. Most special moment of your wedding day? Honestly, the whole day was pretty damn amazing. I can’t say that there is really one special moment above any others. My brother’s toast was pretty cool, though. I thought for sure that he’d say something to tease or embarrass me, but he was very sweet and just talked about how happy Kris clearly made me. 10. The song from your first dance? We didn’t actually do the full reception dance thing – it was just dinner and chatting, because we only had about 25 people there. But we did play “Storybook Love” from The Princess Bride when I walked out for the ceremony. 11. If you were to do your wedding over, what would you change? I loved having a small wedding, but I do wish that there had been some people there who were from Kris’s life. We weren’t back in touch with the Penn State crowd yet, or I would absolutely have wanted them there for him. (Would have made the bar bill a bit bigger… 😉 ) It has always made me a little sad that I had friends and family around me, and he was alone. Happily, my wacky family has wholeheartedly adopted him, and he has adopted them as his own as well. I just hope he’s ok with that. Tags – Hmm… ok, anyone reading this who has or will hit ten years this year – you’re it! (And Hugeness, this means you, too!) Let’s hear it, class of 1998! 😀 And please leave me a comment if you’re going to answer – I want to see! First of all, a VERY happy anniversary, lovies!! Second – Okay. Um. YIIIIIIIKES. 1. I met Travis during a production of Grease. He was talked into showing up because they needed more guys. 2. I was dating a guy named Jason at the time. 3. We started dating shortly after Jason and I broke up, went out for a few weeks, went back to being friends because we were both too freaked, then couldn’t stand it and got back together but danced around it for a while. I’m pretty sure we’re your marriage dopplegangers. That bodes well for us, I think. I love you guys!! This was fantastic to read, and it’s so cool to be hitting 10 at the same time as you both! Thanks for sharing!!! Happy Anniversary! And thanks for sharing all that – it really made me smile! Aawwwww. Congratulations. We’re at 15 years (yikes) so we’re a little ahead of you. I wish you many more decades of happiness and discovery. Happy anniversary! You picked a great date (or I did, I suppose). 🙂 Of course, we were 6 years later. Congrats on the 10 year anniversary! My hubbo and I will be celebrating ours in September! I guess 1998 was a good year for weddings! awwwwwwwww, how sweet! and quite the whirlwind romance! here’s to many more happy year together! Happy happy day to you both! Congrats. Happy Anniversary!! Here’s to many more! Happy anniversary!! I’m very glad that I am not alone in the “still getting that fluttery feeling” when my husband kisses me. I’m class of ’99, so I’ll have to wait on this one for a few months. Happy Anniversary!! It so wonderful to find a strong and happy couple. Here’s to the next ten years!! Awwww! I LOVE that picture of you two, you look so radiant! R and I had our 10 year back in November. I will NOT be posting my wedding picture. And that meme was sweet. Yay for you two! Much love. Cool, my husband had Storybook love queued up on the tape player when we got in the car to leave! I cried, of course. Nope I was wrong, He actually had Romeo and Juliet queued up, but Storybook love is the second song on the mix tape. Y’all are making me cry! Wow! That was a great post! I enjoyed the wedding meme and you being so open! Happy Annivesary!! I wish you an overflow of love and joy for the rest of your lives together!!! Hugs to you both, having known you for the last 4 years (hee hee) I can say that you two are absolutely dripping with cuteness. It would actually be nauseating, um I mean hard to watch if I weren’t guilty of the same with J. Truly, I wish you both nothing but more happiness and a lifetime of love. Congrats! Mine is coming up in December,,, guess 1998 was a very good year! What a beautiful picture, congrats! Yay! 10 rockin’ years – congratulations! Awwww how sickeningly sweet! You even gave cynical ole me hope! Congrats you two! Gosh, what a beautiful bride and groom! Your wedding looks like it was absolutely beautiful, peaceful and tasteful. Happy Anniversary Pam and Kris! May you have a long and happy life together! Happy Anniversary! 10 years is quite an accomplishment. We have 8 more to go on that one. Oh how this warmed my heart while catching me up on some of the missed details over the years. I am sooooo soooo happy for the both of you! Isn’t love just… grand? Congratulations on your anniversary! And here’s to many more . . .
Awwwww.. what a sweet story. Happy Anniversary! 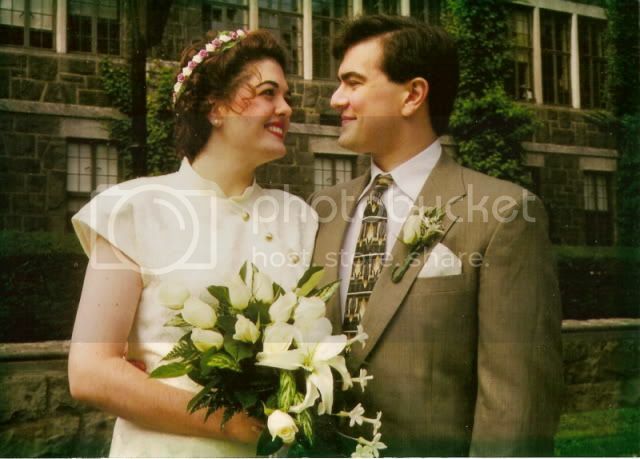 What a beautiful bride you were–and still are! Storybook Love? I would have been BAWLING! Very sweet story. We are celebrating our 12th anniversary in August so I will be saving this for the occasion!